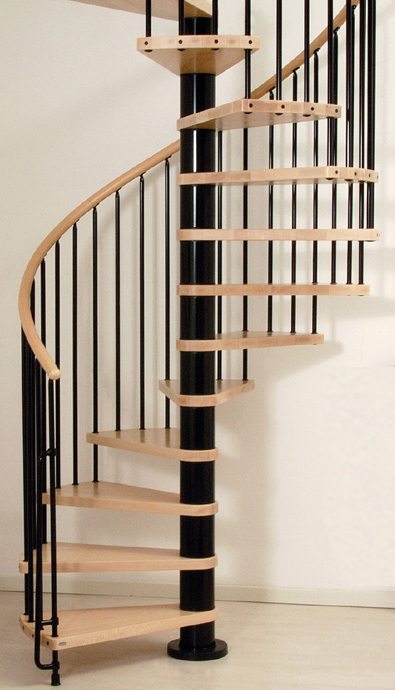 Whether you are looking to increase the useable area of a small living space, or looking for a design feature that that is modern and aesthetically pleasing, a spiral staircase kit may be just the thing you need. What are spiral stair kits? These a convenient, cost effective solution and an alternative to traditional stairs. Kits such as the ones offered by Spiral Stair People, can be ordered directly and delivered to you anywhere in North America. Select the dimensions that you need using our online calculation guides – or if you would like more help, we are happy to talk over the telephone as well. Installation is quick straightforward either for the professional or for the homeowner who has a bent toward DIY projects. Spiral staircase kits have become increasingly popular over the years as housing floorplans have evolved. As recently as the 1960s and into the 1970s, homes were largely compartmentalized into living areas, eating areas, recreation areas and so forth. By the 1980s, homes were becoming more open concept – half walls between rooms and wall cut outs into the kitchen were becoming more popular. Today, many modern homes are truly open concept with one area flowing seamlessly into the next. The open concept trend has given rise to increased popularity of the spiral staircase, as less and less homeowners are looking for a conventional staircase that is hidden away behind a wall, but rather they are more frequently using spiral staircases as functional works of art. Spiral staircases are good choices for indoor applications such as access to a loft or basement as well as for outdoor application such as for decks. If you’ve decided that you’re ready to take the step (no pun intended) and order a stair kit, there are a few things that you can do to help the process go smoothly. Know the building codes – while all of our stair kits are designed to be sturdy and safe, your local building codes may place some restrictions on where and how you can place spiral stair kits. Before starting any renovation plan, it is advisable that you get advice from a local building inspector. Analyse the location – Make sure that you choose exactly the spot you want before ordering your kit. Take exact measurements using our online calculation tools. This will help to ensure that you won’t have to order additional parts after the fact. Select your design – just because you are ordering a kit doesn’t mean there aren’t opportunities to make the design your own. A number of customization options are available from materials, to colours, to accessories. Once you are sure that your plans won’t be hindered by building codes; you have selected and measured your spot and chosen the perfect design; all that is left to do is place your order for your spiral stair kit. Our website makes the ordering process easy, but if you have more questions or would like to speak to one of our professionals, we are always happy to talk on the phone as well.